When choosing the best option for your business energy supplier, your first concern is naturally the cost. We get it – you’re a business, and minimising your costs makes complete business sense. However there are other things to consider when choosing a provider. How responsive is their customer service team? How do they generate their power? Do they partner with charities? Taking a broader view to choosing your provider means you can feel comfortable about the ethics of the company you are partnering with. It also means you might avoid lengthy periods of time on hold. Unlike domestic contracts, businesses are able to negotiate their energy rates. Don’t be afraid to take quotes to the supplier you want to see if they can beat them. But with so many suppliers offering a similar product, how can you tell which is the best? By reading our comprehensive guide to the best business energy suppliers, of course! We’ve compared 30 business energy providers on price, eco-friendliness and customer service. By obtaining sample quotes and comparing fuel mix disclosures, tariffs and Trustpilot scores, we’ve made your life a whole lot simpler. It’s worth mentioning that the ‘out of contract’ rates are effectively the worst possible, and should be a last resort. You will get the best rates if you commit to a fixed rate contract with a provider, usually for a year or more. It’s therefore really important to get quotes tailored to your business, to ensure you’re getting the best possible deal. Fill in this form to get yours. 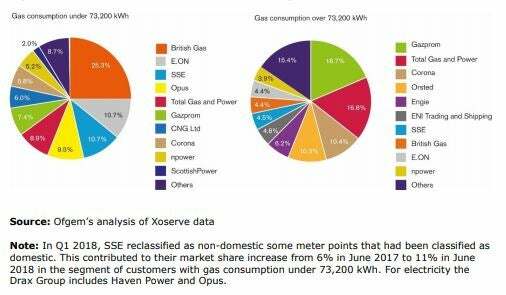 British Gas have the highest market share for both gas and electricity with 15 million customers in the UK. They have, however, lost over 20% of their market share in the last ten years as independent suppliers have gained strength. More on them later. French company EDF generate electricity as well as supplying both gas and electricity to UK businesses. EDF are highly reliant on nuclear energy as a source for their electricity, generating 77% of it in this way. E.ON are a very large utilities supplier, operating in over 30 countries and with 30 million customers worldwide. Over the last ten years, they have invested more than £7 million in renewable energy, and now generate 37.2% of their energy through renewable methods (13% above the UK average). British company nPower may not score especially well among customers, but they are hoping that their proposed merger with SSE might be just the boost they need. With a combined customer base, the two will be able to rival long-time market leaders, British Gas. Scottish Power, owned by Spanish company Iberdrola, are one of the most established members of the Big Six. They have partnered with Cancer Research UK since 2012, and during this time have raised a highly commendable £15 million. Scottish company SSE (formerly Scottish and Southern Electricity) are involved in both the generation and supply of gas and electricity, as well as the operation of gas and telecoms networks. In 2013 they became one of the first major companies to commit to paying all their staff the living wage. We can’t stress enough that the out of contract tariffs are the worst rates you would pay with these companies, and that the sample quote is just that – a sample. Getting quotes with the details of your own business is the only way to be able to make an accurate comparison. And we can’t stress enough how easy it is! The Big Six, as they have come to be known, are the legacy of privatisations that occured in the UK in the 90s. For a long time, their near monopoly of the market has been taken for granted. People often assume that their size enables them to offer the most competitive deals. Over the last few years, Ofgem have reported an influx of new, independent suppliers. These new companies are targeting a public that is increasingly savvy, and increasingly disillusioned with the big corporate energy companies. And they’re succeeding. As a business, choosing the right supplier for your gas and electricity is a really important decision. Utilities account for a significant part of your overheads, so minimising cost is crucial. Making a smart choice can also reduce the valuable time you spend on hold, or ironing out issues. Not only that, but the right company can reduce your impact on the environment, too. That’s where independent business energy suppliers can really excel. They don’t have the brand awareness or market share of the Big Six, so they work extra hard to make their service the best, cheapest and greenest that it can be. Straight away, we loved that London startup Bulb are so upfront about their tariffs. They are listed on their business homepage, with no jargon or complicated rates. They don’t lock commercial customers into 12 month contracts, and they don’t charge exit fees. And not only do they not charge exit fees, they will actually pay yours when you switch to them from another supplier who does. What’s more, their prices are also around 20% lower than the Big Six. Getting new customers is understandably the main focus of most energy suppliers. Perhaps that’s why we find it so refreshing to hear D-Energi’s commitment to offering existing customers their most competitive rates too. Birmingham-based Extra Energy are very clear about their main advantage: price. They offer some of the most competitive fixed business rates in the market, but this sometimes comes at the expense of effective customer service and complaints handling. ‘Big enough to make things happen, small enough to be agile’. That’s the approach of UK business energy supplier, Corona. They have 20 years of experience in providing utilities to businesses of all sizes, and currently hold 14% of the industrial and commercial gas market. Robin Hood Energy was launched by Nottingham City Council. Their aim is ‘to make energy affordable for all’, and their positive reviews would suggest that they are achieving this. Customers seem to be especially impressed by their polite and helpful customer services. As if we weren’t already sold on Bulb after they offered us the cheapest sample quote, they are also the ‘greenest’ independent company we reviewed.100% of the electricity they supply is produced through renewable means, as is 40% of their gas. It’s no wonder they bagged 7th place in the prestigious Startups 100 ranking. As their name suggests, Ecotricity’s main selling point is their eco-friendly ethos. Their electricity is 100% green, and they were the first UK company to commit to this. Their gas is currently 12% green. With ambitious plans to build their own gasmills, the hope is that this figure will soon be 100%. Their rates are not always the most competitive, but they are still considered good value for money. Open SO Energy’s website and you’re greeted with a clean homepage and a simple slogan: ‘great value green energy made easy’. We like these guys already. They have signed up to the ‘Energy Switch Guarantee’, prioritising a hassle-free switch for new customers from their previous suppliers. They actually say the whole switching process should only take five minutes. SO liaise with your previous supplier and arrange the whole thing. Solarplicity came from a background in solar energy, and now offer both gas and 100% renewable electricity to businesses and homes. Despite their claims of ease and transparency, their customer service seem to miss the mark. The first thing that stands out on the Yü homepage is the number of awards that they have won. In 2017 alone, they scooped business of the year, and were finalist for best utility provider of the year three times at various awards. Their reviews, of course, aren’t always perfect. What we love, however, is how every negative review has been followed up by a member of staff with a personalised message of how they intend to help resolve the issue. It’s this attention to detail that ensures small companies have a chance to make it big. They plan to soon branch out into ‘Yü Water’, too. We were pleased to see that Bulb’s customer service was on par with their competitive pricing and eco-friendly ethos. Their focus on providing a simple, streamlined and transparent experience is clearly paying off. To have a Trustpilot score of 9.8 is an incredible achievement. Shoreham-by-Sea based Affect Energy are a company with a promise: energy that is simple, painless and great value for money. They boast an excellent Trustpilot score, and won a commended award for energy provider of the year at the Moneyfacts Consumer Awards 2018. Their website is easy to navigate, and you can submit your contract end date to be contacted nearer the time with Affect’s best offer for your business. One customer sums it up perfectly: Affect are ‘big enough to cope; small enough to care‘. SO Energy have signed up to the ‘Energy Switch Guarantee’, prioritising a hassle-free switch for new customers from their previous suppliers, and promise that the whole switching process should only take five minutes. Their Trustpilot score is proof that they are not only following through on this guarantee, but supporting customers throughout their contract as well. As we’ve already seen, D-Energi offer some of the most competitive prices for new customers. However, it’s their commitment to offering equally competitive rates to their existing customers which has earnt them such an impressive Trustpilot score. UGP are a relatively new UK energy supplier, and previously traded under the name ‘Lancashire Gas and Power’. UGP are a great option for a business of any size, particularly one that is looking for a provider for both electricity and gas as they offer discounts for dual tariffs. They don’t have standing charges on many of their tariffs, making it really easy to work out your costs. They also have competitive rates and an excellent Trustpilot rating. Utility Warehouse aren’t called a warehouse for nothing: they can supply electricity, gas, phones, broadband and mobiles for your business. They incentivise customers with cashback offers and partner discounts. For ‘gold’ customers (those who take four services) they also offer to pay any termination fees you encounter up to the value of £200. Opus Energy have really been making waves in the business energy sector since their formation in 2002. 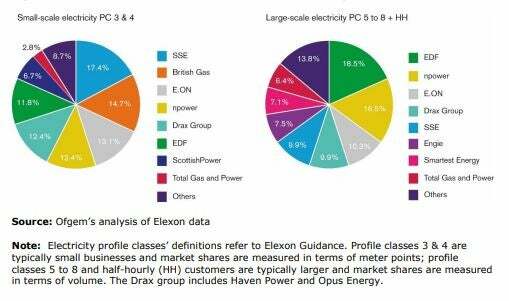 In 2015, they actually broke the legacy of the Big Six, positioning themselves as the sixth largest business energy supplier. They scooped up the award of Utilities Provider of the Year 2017 at the British Small Business Awards, and have been features on The Sunday Times Grant Thornton Top Track 250 league several times. Their reviews, however, are a real mixture of ‘bad’ and ‘excellent’, suggesting room for improvement in some areas. Axis Energy are a small, independent utilities, broadband and mobile provider. Being such a small provider, no Facebook or verified Trustpilot reviews are available. This has admittedly made it hard to assess how good their customer service is. However, they aim to answer all calls within 30 seconds, and their average wait time is only 16, so that can only be good news. Flow want their customers to know that they will not lock them into a fixed tariff. Variable tariffs are traditionally far more expensive than fixed ones, but that’s where Flow are different. They offer some of the most competitive variable rates on the market. They also give you the option to upgrade to a 100% renewable energy plan (the standard rate is 50%) for slightly more money. There are several business utilities companies which are offering a good service, but didn’t quite come out on top for our chosen categories. Depending on where your business is based and its energy needs, any one of these companies could easily offer you the best deal and a reliable service. According to the Citizens Advice Bureau, PFP Energy have received the lowest number of complaints per 100,000 customers of any energy company in the UK. They do not display their business tariffs online, but their site is very modern and user-friendly. YGP specialise in providing gas and electricity to businesses.They may not have any Trustpilot reviews, but their number of complaints raised last quarter – zero – is testament to their commitment to providing the ‘finest customer service in the industry’. They also guarantee to beat your renewal price or give you £100. With promises like that, it’s no wonder they’ve set their sights on challenging the Big Six. Go Effortless Energy don’t have a Trustpilot score, making it hard to know how they are perceived by customers. In terms of trust indicators, we like that they display their prices clearly on their website. They have also published the details of their complaints from 2017. Well, complaint really – there was only one, and it was resolved in eight weeks. This is really evidence of a commitment to transparency and a high level of customer service. Crown Gas and Power want to push value and visibility for their commercial customers. A lack of online reviews makes it somewhat hard to assess whether they’ve managed to achieve this. Their website is a little old-fashioned but easy to follow, and they have a dedicated email and phone line, which can only be a plus. BES Utilities specialise in providing commercial gas and electricity. They are committed to treating their customers fairly, and publish a report each year detailing the steps they are taking to ensure this is always the case. Despite this, their customer reviews leave a lot to be desired. In 2015, they were also investigated by Ofgem for misconduct and had to pay a hefty fine. Utilita offer ‘pay as you go’ business energy, with a ‘one tariff fits all’ approach. They also offer smart meters to monitor your usage. Unfortunately, reviews would suggest they are falling short somewhere along the line. Dual Energy are keen to offer business energy solutions that are smart. They offer free smart metersto all their customers, allowing you to easily track what you’re using. You can also agree to a one or two year contract, tailoring Dual’s service to your own business needs. Choosing a business energy provider needn’t be the headache that it once was. The prices above are only estimates for an imaginary, North London based company. Rates will vary hugely depending on region, supplier, usage, contract length and meter type. To get the best deal for the specific needs of your business, it is always worth getting quotes from a variety of suppliers. And remember – with so many providers on the hunt for new business, you are in a powerful position. Don’t be afraid to negotiate!